Gene Thiessen was a motorcycle racer from Eugene, OR who raced in the 1950s for the motorcycle company BSA, including the Daytona 200 and Nationals, along with multiple regional races, and stacked up land speed records. 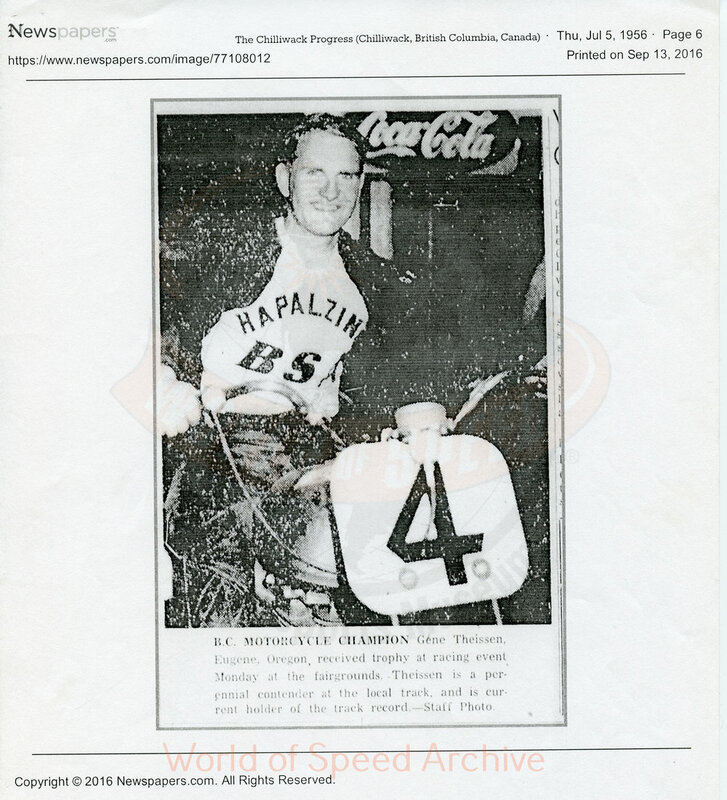 A binder was recently donated to the World of Speed Archive with a collection of photocopied articles, photos and programs focuses on Gene’s racing years. 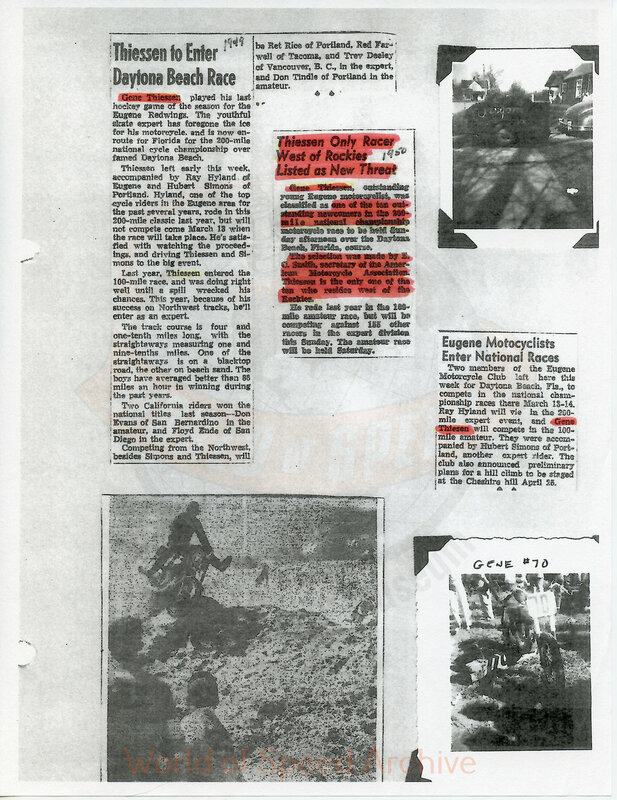 Flipping through these recently digitized pages, the story of BSA, motorcycle racing into the 1950s, the burgeoning of brand teams, and technological advances are all found in Gene’s story. Gene started racing in the late 1947 and by 1949, had won two amateur PNW T.T. Championships. In 1951, he won his first professional races, including at Portland Meadows, where he also broke the track record. Gene was quickly making a name for himself on the national stage. He soon became part of BSA’s “Gold Star” team, racing in the 1949 Daytona 200 National Championship. Gene is second from the right on the #84 BSA. Gene raced a BSA Star Twin which were only in production 1949-1954. When going for land speed records, Gene also rode a BSA Golden Flash. Both his Golden Flash and Star Twin were modified from their stock version for ultimate speed. On the Bonneville Salt Flats, Gene was able to make two land speed class records, going 123.69 mph in his Star Twin and 143.54 mph in his Golden Flash. He was able to switch between track and land speed racing, keeping up the speed at both. Gene was quickly becoming the face of BSA as he racked up land speed records. At the same time, BSA was amping up its marketing of their Star Twin to the masses as its racers continued to show what the bike could do. At the same time Gene was on the scene, Harley-Davidson was also building its brand and own market team. Women motorcycle clubs such as the Motor Maids (est. 1940) were on the scene with members racing at national races, including Montana Baker. By 1953, BSA was taking the lead with racers racking up positions, creating a sweep in the Nationals with Thiessen holding the line at #9. In 1954, Gene Thiessen, born and raised in Eugene, OR, won the first National race in the Pacific Northwest. Racing a Gold Star, Gene won the nationals and took third in the trophy dash. Gene would race for two more years—1957 being his best—before retiring from professional racing after the 1958 season.